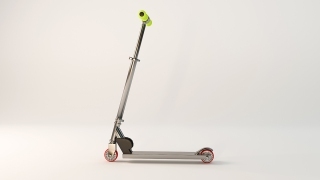 File photo of a Razor scooter. A 7-year-old boy on a Razor scooter was hit and killed in Ben Lomond in unincorporated Santa Cruz County on Monday afternoon, according to the California Highway Patrol. The collision was reported at 2:38 p.m. in a driveway on Newell Creek Road north of Rancho Rio Avenue. A 44-year-old Ben Lomond man was driving a white 2018 Toyota 4Runner when he hit the boy in the driveway. The boy, a native of Colombia, died at the scene, CHP officials said. His name was not immediately released. The driver said he did not see the boy. The exact cause of the collision is under investigation, but it does not appear that alcohol or drugs were factors, according to the CHP.